The cause of the extinction has long remained a mystery. Theories that have been put forth have ranged from overkill by North American paleolithic hunters to the impact of a large comet or swarm of meteors. But all have been shown to have serious flaws. Now, Starburst Foundation researcher Dr. Paul LaViolette has found evidence that this mysterious die-off may have had a solar flare cause. In his paper published this week in the journal Radiocarbon, LaViolette concludes that a super sized solar proton event (SPE) impacted the earth about 12,900 years ago (12,837± 10 calendar years BP). * He notes that this date roughly coincides with that of the Rancholabrean termination, a time boundary beyond which the numbers of extinct megafaunal remains are found to sharply decline. Solar proton events, blasts of energetic solar cosmic ray particles that are shot out with the eruption of a solar flare, can arrive with little advance notice, traversing the 93 million mile distance from the Sun to the Earth in a matter of hours. They are usually followed some days later by a slower moving solar wind plasma shock called a coronal mass ejection. They have been observed to occur from time to time in past decades, but none in modern times have been strong enough to pose a serious ground-level radiation hazard. 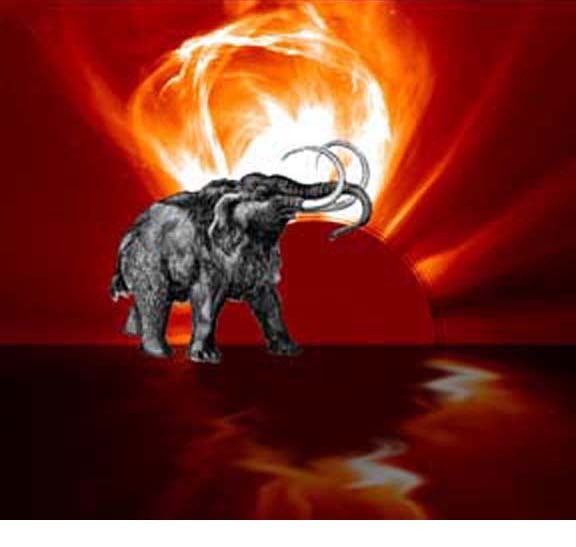 * LaViolette, P. A., Evidence for a solar flare cause of the Pleistocene mass extinction, Radiocarbon 53(2), 2011, pp. 303-323.